It’s hard to believe the CNE is over, the Labour Day weekend has just passed, and everyone is “back to school”. But don’t fret, technically summer is still here until September 22, peaches are still plentiful, and now is the perfect time to bake up the best pie you’ll ever eat! So many people are afraid to make their own pie crust, and I have to admit it is almost magical how butter and flour can turn into something so flaky and delicious. But honestly, it’s not hard and the ingredients are so simple. You can totally do this, I have all the instructions and even some video to show you how it’s done. One key thing to remember is the importance of keeping your pastry cold. The butter has to be cold right from the start, and you can’t skip the various stages of putting the dough in the fridge when directed. Keep working the butter into the dough until the texture is a coarse, crumbly mix with even, peppercorn sized lumps of butter throughout. Add ice water (again, very cold water is key, I set aside a small bowl with cold water and add ice cubes, and measure out from there), a little at a time, mixing with a fork and adding only what you need for the dough to hold together. When you think it’s ready, take some in your hand and press it together. 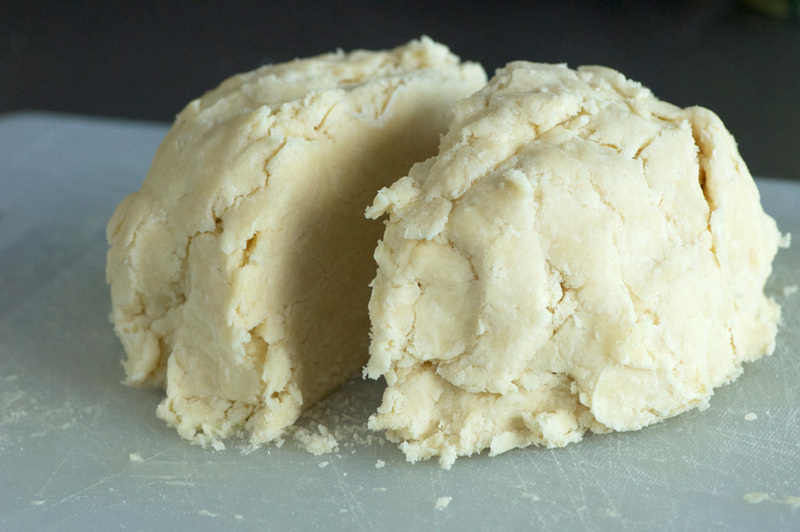 If it holds together and looks roughly like the photo below, it’s ready to be kneaded together. Knead the dough together until all of the crumbs are well combined into a nice, smooth (but somewhat craiggy) ball. While you don’t want to over-work the dough here and risk the butter getting too warm, you also don’t want to under-do it and end up with crumbly dough that won’t roll out nicely. I usually knead until it’s holding together well, then knead a few more times just to really combine everything well. Divide your ball of dough in half, and then press each half onto a sheet of plastic wrap, forming each into a flattened disk about 1″ thick. I press them out with my palm and press the sides in to shape them as shown below. Then wrap them up and place into the fridge for about 50 minutes. Meanwhile you can work on your filling. Peel and slice your peaches (fastest method: cut around the circumference of your peach to the pit, twist peach in half. Then slice peach into quarters. Hold a peach quarter in your hand, peach skin facing you. Slide your knife under the top corner of the skin, and in a single motion pull the skin off from top to bottom using the knife.) Another real time saver is to use frozen peaches (if you can find them—I get mine at MacMillan Orchards in Ajax) as they come already peeled and sliced. (Also this allows you to enjoy this pie all year round!) 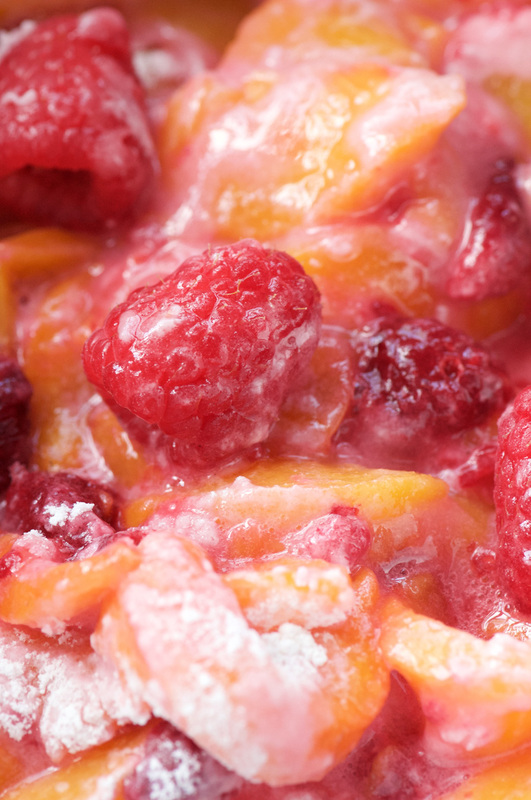 Mix the peaches with sugar and flour, and then add the raspberries. By now your pie crusts should be done chilling. Prepare your work area with flour and roll out the bottom crust. Once you’ve draped it over the pie plate, get it back in the fridge for a good 30 minutes. During this time you can make your Egg Wash and cut up the final two tablespoons of butter. Next roll out your top pie crust, and then add the filling to your lower crust. Dot with that butter, and brush the pastry edges with Egg Wash. Roll your top crust onto the bottom and trim the excess pastry from the edges of the pie plate. Crimp the edges together, and back in the fridge it goes for another 20 minutes or so, to allow the top crust to chill. Finally, cut vents into the top crust, brush with Egg Wash all over, and sprinkle with coarse sugar. I love to get decorative with my pie crusts and make leaf shaped vents, and add extra leaves on top (“glued” with egg wash) to make the prettiest pie. You just can’t buy a pie that looks like this at the store (and the crusts on those don’t even come close to the flakiness level of this one!) 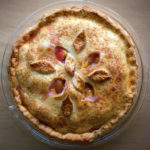 Bake at high heat to brown the crust, then turn down the heat for the final phase to finish the pie and bake the fruit. I love to serve with vanilla ice cream on the side. 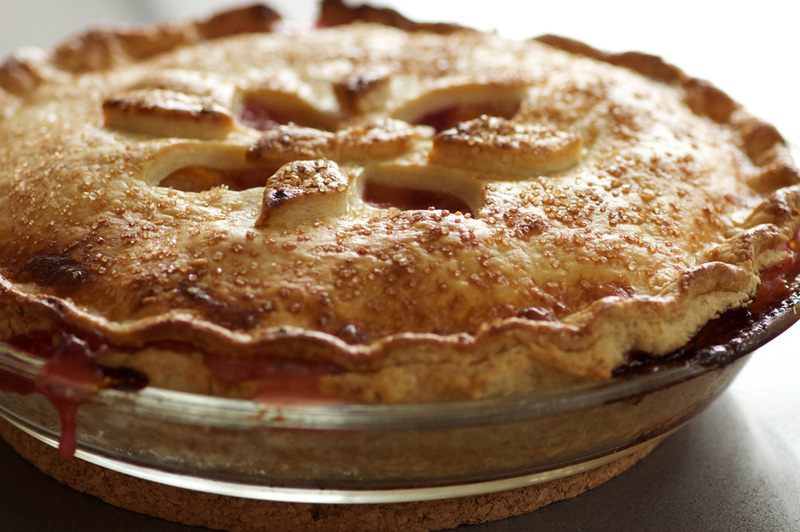 Once you’ve had homemade pie like this, you’ll never want to go back to store-bought! My favourite pie, hands down, is this peach raspberry double-crust. Make pie crust: Place flour, sugar and salt in a large bowl; stir to combine. 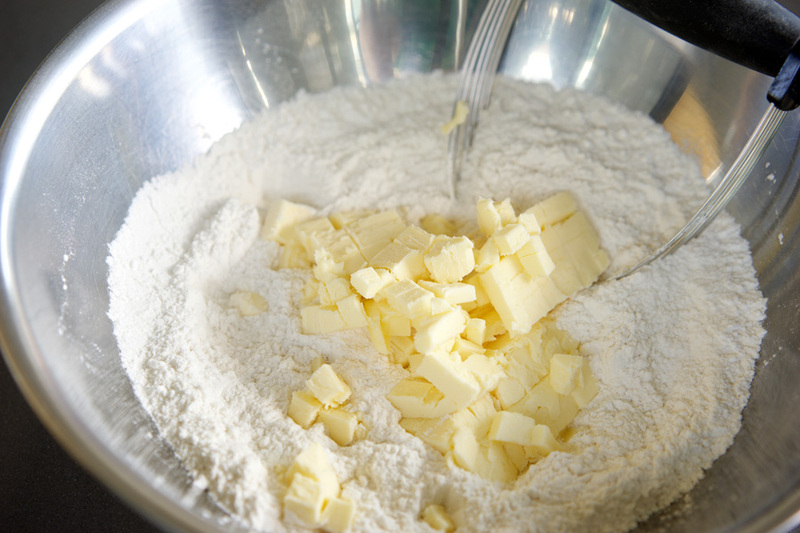 Cut butter into small cubes and add to the flour mixture. Cut butter into flour using a pastry cutter or two knives, until the butter is broken down into tiny but discernible lumps with the flour. Mix in ice water with a fork until dough just comes together. 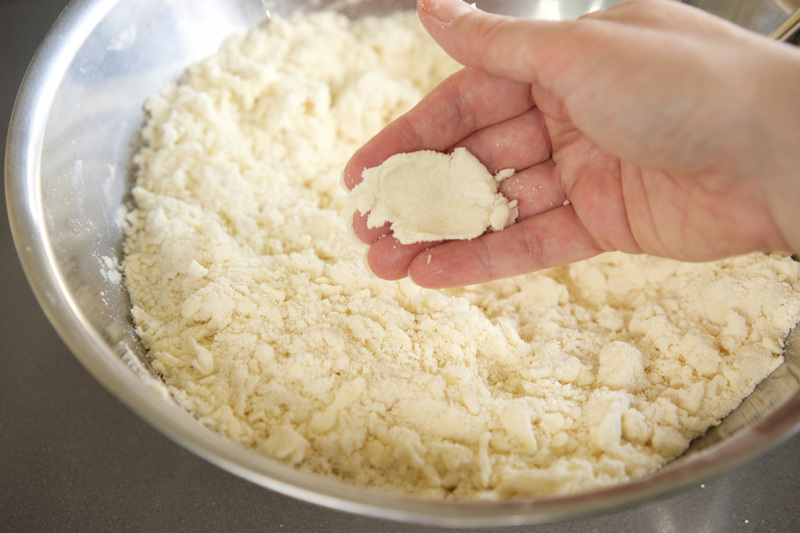 Press some of the dough between your fingers to check the consistency, it should hold together well. Lightly knead the dough until all crumbs are incorporated into a craggy ball of dough. Don't over-knead at this point, but under-kneading will make fora crumbly dough when you go to roll it out, so aim for fairly smooth ball. 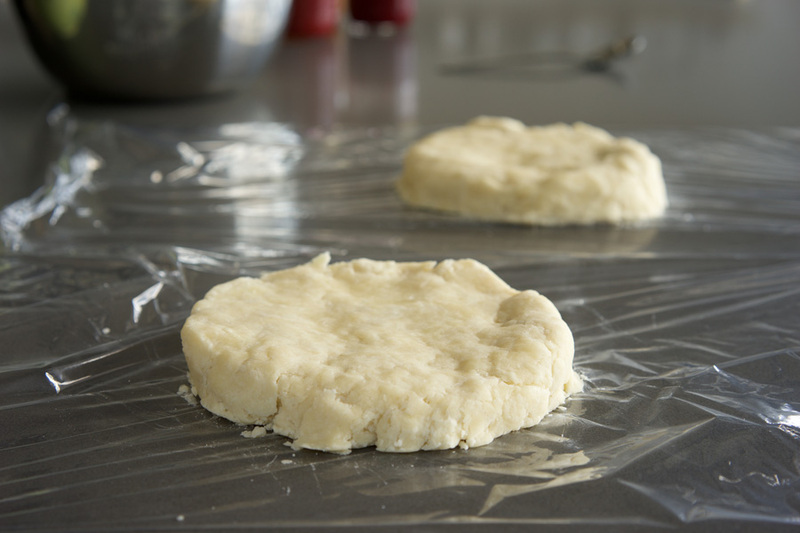 Lightly flour your work surface, and roll out your first dough half to approximately 1/8" thick. I always take my pie plate and hold it over the dough to see if it's been rolled out large enough. Use the rolling pin to lift the dough by gently rolling the dough onto the pin, starting from one of the edges. Drape the pastry over the pie plate, adjust to fit evenly over the dish and resist the temptation to fuss with it or press it down into the dish. Transfer to the fridge to chill for 30 minutes. Make the filling: Combine the peaches, sugar and flour, stir to combine. Add the raspberries last and combine gently to keep them intact as much as possible. Make Egg Wash: beat egg and milk together in a small bowl. Have a small brush ready. Cut up the final two tablespoons of butter and set aside. Roll out your second pie crust. Grab the bottom crust out of the fridge and add the fruit filling—if the mixture is looking really juicy sprinkle with a few more tablespoons of flour. Dot with butter. Grab the reserved Egg Wash and brush it onto the edges of the bottom pie crust. Use your rolling pin to pick up the top crust and place on top. Using a knife, trim the excess dough from the sides of the pie dish. Go around the edges of the dough crimping the top and bottom crust together by placing your index finger under the crust and pushing up while pressing down on either side with your other index finger and thumb. Chill in the fridge for 20 minutes or so. Remove pie from fridge and cut vents in the top crust. You can either cut simple slits on top of your crust or get creative with them. I like to cut out leaf shapes in the centre. Then I take some of the extra dough, cut it into more leaves as needed, and use Egg Wash to "glue" the pastry leaves onto the top crust to make a decorative pattern. Last step before baking: brush the entire top crust and edges with Egg Wash, and sprinkle with coarse sugar. Bake at 425° for 20 minutes. 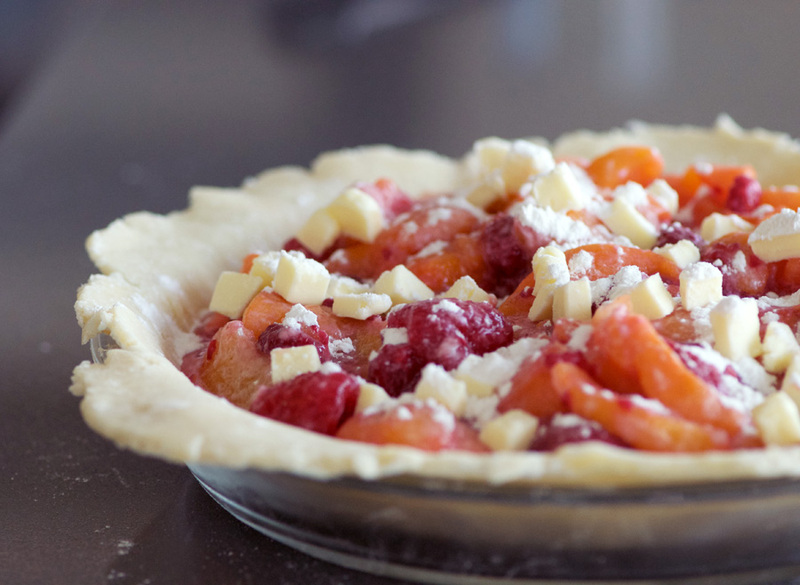 Reduce heat to 350°, and bake for 30 – 40 minutes more until the fruit is bubbling and the crust is golden. Resist slicing the pie for about 20 minutes or so to allow the filling time to thicken up slightly. I like to serve with some vanilla bean ice cream on the side.